A working Raspberry Pi system requires lots of other parts in addition to the tiny Pi board itself. You'll need a power supply, a mouse, various cables, and, unless you already own one, a monitor to display screen output for your Raspberry Pi system. Raspberry Pi users are accustomed to hunting up old monitors from long-discarded computers, or temporarily requisitioning a monitor from a currently running system to use as a display for the Rasp Pi. The clutter of a full-size monitor, however, often invades the elegant simplicity of the Raspberry Pi. Monitors tend to be big and bulky, and they typically require their own power cable, which adds more congestion and complication to the tabletop configuration. A Rasp Pi by itself can inhabit an unobtrusive corner of the room, but add a monitor to it, and it really doesn't look much different from a conventional PC. Some users solve the monitor problem by running their Rasp Pi headless through an SSH connection, but SSH requires you to boot another computer on the network (which, undoubtedly, has its own monitor anyway). Since the first days of the Rasp Pi, users have dreamed of a mini-monitor that runs on the Rasp Pi power and is tailored for the needs of the Rasp Pi environment. Some third-party Rasp Pi displays have appeared in the past, and we have reviewed some in this magazine, but those who follow the Pi have known for some time that the Raspberry Pi Foundation would eventually announce an official Pi display. The Raspberry Pi display  was announced on September 8. In addition to serving as a general device for viewing screen output, according to the foundation, the new display also "gives users the ability to create all-in-one, integrated projects such as tablets, infotainment systems, and embedded projects." The new 7-inch display has touchscreen capabilities. With a price tag of $60, the Rasp Pi display came to market nine months past its originally planned release date . The foundation has explained that the delays resulted from efforts to integrate the Raspberry Pi 2 and difficulties encountered in locating a supplier for the screen. The display screen measures 7 inches across the diagonal or 155x86mm. The entire screen, including the frame, measures 194x110mm, and the overall depth, minus an attached Rasp Pi, is about 20mm, with a weight of 277 grams. The screen has 10-finger capacitative touch, although standard Linux desktop environments currently do not handle touch gestures well. The Rasp Pi supports a number of display interfaces, such as HDMI. 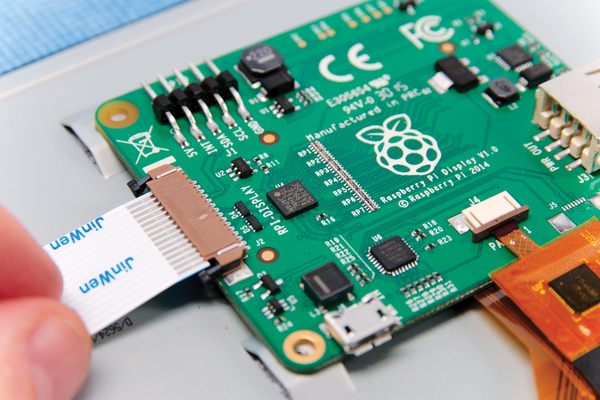 For some screens that are already available for the Raspberry Pi, the little computer also relies on the GPIO interface. The Raspberry Pi Foundation looked to the underused Display Serial Interface (DSI) in order to connect the Rasp Pi with the screen . You will find the DSI port on the side that is opposite from the network and USB ports. The DSI connector transmits more than just images. It also sports an integrated I2C-Bus, which makes it possible to transmit gesture entries and control signals for background lighting. As a result, the screen will only work with second-generation Raspberry Pis or the plus models, which are the first series Rasp Pi A+ and the B+. The display board does have two extra pins for the Rasp Pi B. However, according to Pi developer Gordon Hollingworth, the foundation still needs to work on support for the pins. The first purchasers receive the display as a kit that requires assembly. Even though no assembly instructions are included, the components are easily put together. You should first set the display board upside down next to the screen and connect the board to the ribbon cable that comes out of the screen. Then, turn the board over and adjust it so you can properly mount it. Next, very carefully plug the second ribbon cable that comes out of the screen into the small jack on the front side of the display board. This cable carries signals from the touchscreen. With the braid side facing upwards, plug in the ribbon cable, which will be connected to the Rasp Pi, and then, using a spacer, screw the board to the screen (Figure 1). Figure 1: Purchasers have to assemble the first Rasp Pi screens on their own. Future versions of the display will come preassembled. Now you need to decide how you want to supply power to the Rasp Pi and to the screen. Like the Rasp Pi, the screen has a micro USB connector, which means you can either run the power from the display to the Rasp Pi via the USB jack, or you can use the jumper cables that are included to wire the Rasp Pi for 5V and GND with the pins that are on the pin strip. We chose the jumper cable method for our test. The first step is to connect the red cable to the 5V pin and the black cable to the GND pin, then set the Rasp Pi on the spacer. Then, connect the two connectors to the 5V and GND on the Rasp Pi. Figure 2 shows the pin assignment of the GPIO port for a Raspberry Pi 2. To reduce the size of the depth of this arrangement, you can also mount the Rasp Pi the opposite way around to the display board. The final step to this process is to connect the DSI cable with the USB power supply (Figure 3). 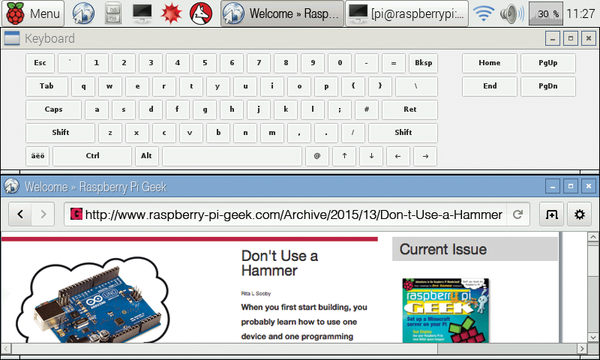 Figure 2: The GPIO pin assignment for a Raspberry Pi 2. The user will find the 5V and GND pins across from pins 2 and 3 for connecting to a power supply. 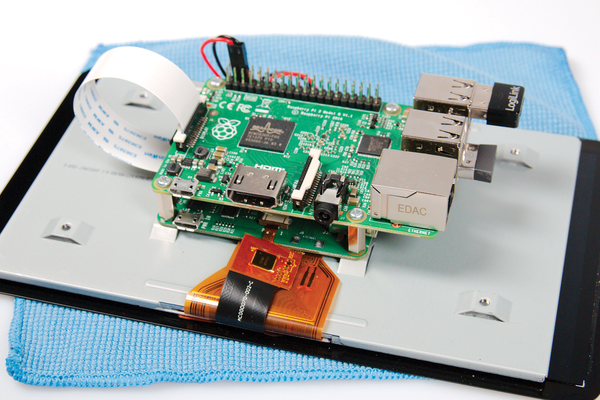 Figure 3: You can attach the Rasp Pi directly onto the screen board. With respect to the software, all you need to do is update the system (Listing 1). If updates are not properly installed, you will be able to see images on the screen, but the screen will not accept any entries. After a restart, the Rasp Pi will promptly display the image that is familiar from the HDMI port on the screen without any modifications to the system. Touch entries will also immediately function properly within the X server GUI. The 800x480 resolution should suffice for everyday use, even though it is not a substitute for a desktop monitor (Figure 4). The touchscreen has the same level of precision as tablets or smartphones that are currently available on the market. Figure 4: The 800x480 resolution of the RasPi touchscreen is sufficient for most projects. The Matchbox keyboard from the package sources even gives the user a virtual keyboard. You can install a virtual keyboard like the Matchbox keyboard in order to enter text without a USB keyboard (Listing 2). Typical desktop environments like LXDE from Rasbpian generally do not function properly with touchscreen entries. The problems are especially noticeable in the web browser, where you can't just type and scroll from just anywhere on a page. Instead, you need to use the scroll bar on the edge of the window, which is hard to do with a finger. It is likewise difficult to use touch gestures for adjusting the size of program windows. Connecting the Rasp Pi display screen through the DSI port frees the HDMI port, which is then available for attaching a second monitor. However, you do not automatically get an image on a second monitor. Instead, you first need to indicate to the program, such as a video player, that you would like to send the images to an external screen. The example from Listing 3 starts the video on the second screen while the GUI on the Raspberry Pi screen remains free for other activities. At this point, there is still no genuine dual-display function that turns the Rasp Pi display and a monitor connected via HDMI into a large display. The graphical tools used for setting up the resolution via Menu | settings | screen settings still only recognize the Rasp Pi screen. Instructions for manually configuring a monitor set up via the /etc/X11/xorg.conf file are not yet available. Display T. Box is a Raspberry Pi with a touch display in a compact case. The newest version of the Box comes with revisions that include a better touch screen and more speed. Typically, the Rasp Pi transfers video data via HDMI to a TV or screen. For mobile access, you can connect the tiny computer to a similarly small touchscreen instead. Display T. Box combines a Raspberry Pi 2 with an integrated touchscreen. The result is a complete mini-PC that can be used as soon as you supply power.